Starting off at the footpath opposite Tottington Drive in Small Dole, cross the fields where it’s worth looking on the telegraph wires as occasionally a cuckoo is seen, and the public footpath takes you along the edge of a wood before turning right down to a bridge that leads you into the few houses that makes up New Hall. Many woodland species can be encountered here, including green and goldfinches and is one of the only places on the walk where you might see house sparrows! Following the rough road that takes you past New Barn Farm, this is a good place to listen for skylarks in spring and it is worth looking on the pylons for a resting peregrine falcon. Take the public footpath down past the entrance to Stretham Manor, where in 2004 we saw 6 waxwings, and you come to the River Adur, sometimes stonechats are here and you might be very lucky to see a barn owl. Join the Downs Link and head towards Henfield where after about 300 metres take the stile on your right and head along the stream back to the road. Anything can be seen here, reed warblers in summer, green sandpipers and kingfishers in winter, reed buntings and yellowhammers all year round. 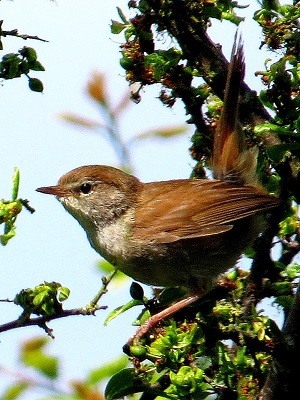 As you reach the Mill Farm, listen out for nightingales in summer and Cetti’s warbler at any time. On reaching the road, turn right and walk back along the road to the starting point.